• Tech support 24/7 and regular system upgrades. “Yongin’s legacy system already had scalability and efficiency issues that resulted in frequent storage overloads and lost revenues,” said Gabriel Kang of ITservices, an IT provider for Yongin. “But Yongin couldn’t afford entirely hardware-based solutions with the performance and capacity to handle thousands of high-definition video feeds”. The city replaced 2,000 video cameras with HD units that stream video via Ethernet to 15 Windows Media servers at the data center. The servers forward the data to two Mellanox switches, which link via InfiniBand SRP 40Gbit/s to an AIC HA401-CP2 storage appliance running the RAIDIX software. 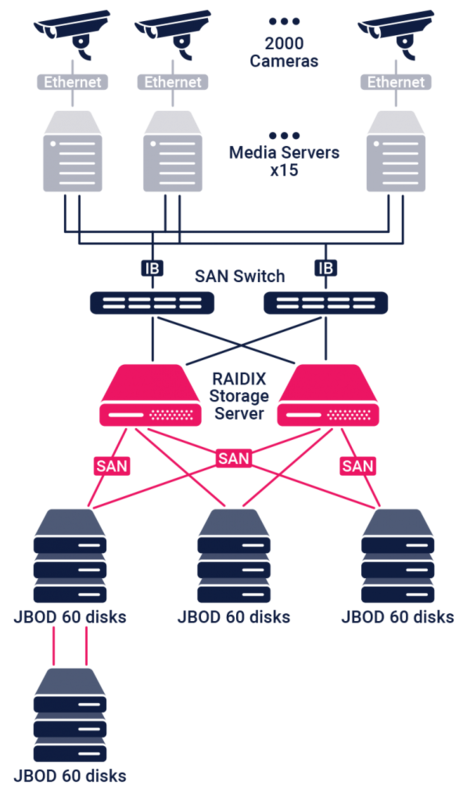 The RAIDIX storage appliance connects via dual 6Gbit SAS links to four AIC XJ3000-4603S JBODs. Each JBOD houses 60 disks, providing one petabyte of capacity in a single rack. The RAIDIX software puts an end to lost revenues by providing a resilient storage infrastructure that ensures stored video is intact and always available. Yongin now enjoys extraordinary data protection and the security of triple-parity RAID. For additional value, the multilingual, web-based R AIDIX user interface allows administrators to configure, monitor, and manage the storage system’s software and hardware. They can graph real-time statistics to verify performance and facilitate troubleshooting.